GTbets is best known for its #1 ranked bonus offers, as well as their state of the art wagering platform. Having a solid and stable reputation since 2011, they remain a top-tier option for players to safely enjoy their gaming. In addition to sports, they provide an unmatched casino experience on desktop and mobile, through a wide variety of entertaining games. Every customer in need is met by their excellent and attentive customer service team, from signing up their account to making sure that their payout is processed with speed and safety. Players residing in the following US States are not allowed to register a real money account. Delaware, District of Columbia, Kentucky, Louisiana, Maryland, Mississippi, Missouri, New Jersey, New Mexico, New York, Nevada, Oregon, Pennsylvania, Rhode Island, Washington, and West Virginia. As far as incentives go, plainly said, GTbets has the best sign up bonus in the industry. It offers players the choice of a 100% cash bonus up to $250, or a 50% cash bonus up to $500. Not only that, but all sign up and reload bonuses are cash bonuses. This means that customers keep both the wager amount offered to them, and the win amount. Most well-known sports books offer free play bonuses, which only allow customers to keep their win amount on their wagers, not the risk amount. Another crowd pleaser that GTbets offers is the Favorite Teams Point Discount. This allows players to pick two of their favorite teams from each of the following: NFL, College Football, NBA, and College Basketball. The players can then get a free half point on their selected teams any time they play, which increases their odds of winning. Weekly Casino Rebates: 10 % of all losses in the Casino are given back to players as a cash bonus every Tuesday. Monthly Horse Rebates: 15% of all net losses on horse betting is returned at the end of the month. 15 Team Parlays: The parlays give customers a chance to win big with a low risk, a mere $5 15-team parlay wager gives them a shot at the $50,000 minimum progressive jackpot! There is a wide range of sports for players to place wagers on at GTbets. These international and U.S. based sports include: NFL, NCAA Football, the NBA, NCAA Basketball, Baseball, Hockey, Soccer, MMA/Boxing, Golf, Tennis, Auto, Rugby, and Cricket. 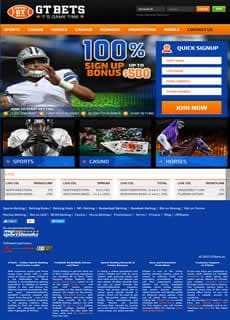 They also offer a wide variety of wagering types, including straight wagers, money lines, parlays, totals, teasers, round robins, point buy/sells, if bets and progressive parlays. Players also have the ability to bet on half time wagers, quarter wagers, 1st 5 innings, run in the 1st, futures, live-in game wagering and propositions. This wide variety of wagering options allows players to place bets that are catered to their specific liking. Player status will determine their wagering limits, however GTbets allows bets as small as $1, up to standard limits of $5,000 per side in sports like NFL. The live in-game betting option can be used for sports such as Football, Baseball, Basketball, Soccer, Hockey and Tennis. Live action in-game betting is an interactive way of betting, where players can bet minute to minute as the game is going on. This allows for more accurate betting, where a player can take into consideration anything unexpected that happens during the game, such as injuries that may occur, since it is live and anything can happen. This is also a great way for players to either hedge existing bets based on the flow of the game, or double down on a bet at a better line. The mobile site that GTbets offers is designed for easy navigation an excellent User Experience. The interface is intuitive with well-placed menus, and it gives players all the same options as the desktop site. The mobile site is an excellent feature because it allows users to bet from anywhere and because of this makes it much easier for them to participate in live-action betting. The mobile casino is also second to none, offering more games than any of their market competitors, and also mobile casino tournaments. Not only does GTbets offer a high quality sportsbook, their casino product rivals anyone in the industry. It offers a wide variety of online games with impressive graphics, which is one reason that the casino is taking the industry by storm. The casino consists of games made by both BetSoft and Arrows Edge Software, and have both Desktop and Mobile versions available. The high jackpots and random progressives give players many chances to win big! With an average industry experience of 8+ years, the GTbets customer service team is highly experienced and capable of handling any issue without unnecessary holds or transferring. Priding themselves on lightning fast responses, you will not be stuck waiting on the support team during their 20 hour a day, 7 days a week, 365 days a year schedule. When making a deposit, all major credit cards are accepted as well as Bitcoin, person to person transactions, and Skrill and Neteller. Keep in mind that any deposits made using Skrill and Neteller, will only qualify for the 50% to $500 cash sign up bonus. Payout requests at GT are handled quickly and professionally. Customer Service, as previously mentioned, is always available for inquiries and to help with any payout issues. GTbets prides itself in getting your money to you as fast as possible, as this is one of the key elements of making its customers happy. Players can receive payouts using the following methods: Bank wire, Bitcoin, Back2card, Check by Courier, Cash, and Skrill, and Neteller. All Bitcoin payouts are completely FREE OF CHARGE, which allows customers to get their payouts quickly, safely, and cheaply.